Consumers are seeing their spending for Fourth of July festivities this year rocket to $7.1 billion, according to a survey conducted by the National Retail Federation. Consumers are seeing their spending for Fourth of July festivities this year rocket to $7.1 billion this year, compared to $6.8 billion in 2016, according to a survey conducted by the National Retail Federation, a Washington, D.C.-based trade group. The annual survey revealed that 88% of Americans, or 219 million people, will partake in celebrations and, in turn, spend money on items, including food and beverages for picnics, fireworks and traveling. The average amount 162 million consumers were planning to spend was $73.42 per person, compared to $71.34 last year for a cookout or barbecue. 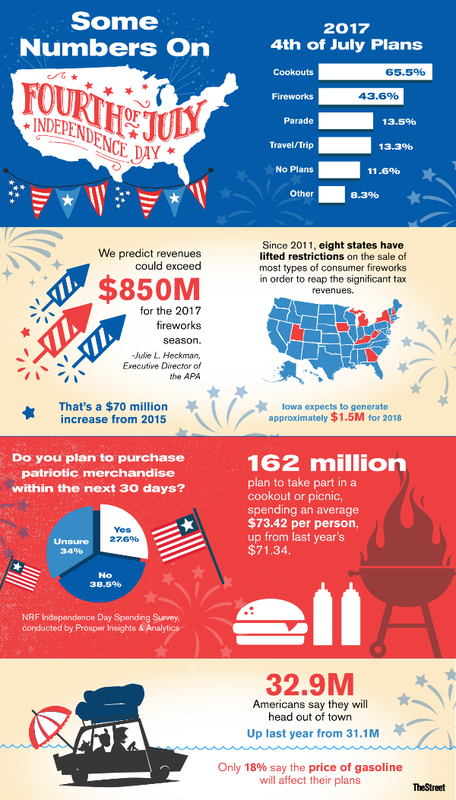 "With warmer than average weather so far this summer, Americans should be in the mood to head outside to celebrate, whether it's watching fireworks or firing up the BBQ," said NRF CEO Matthew Shay in a statement. "Retailers will be well-stocked with everything from flags to burgers to help Americans prepare for their holiday activities." Consumers also plan to shop for patriotic items with 28% who said they plan to buy a flag, decorations or apparel. The survey demonstrated that 65% of people own a U.S. flag, 53% own patriotic-themed apparel such as flag-emblazoned T-shirts or bathing suits and 40% have decorations. Buying fireworks is a tradition for many Americans who are estimated to spend more than $850 million this year, said Julie Heckman, executive director of the American Pyrotechnics Association, a Bethesda, Md.-based trade group. Last year consumers spent $825 million on fireworks, a $70 million increase from 2015. Traveling during this holiday is also quite common with 32.9 million Americans who said they plan to head out of town, especially since gas prices are lower and do not play as much of a factor into their budgets. Many consumers plan to celebrate by attending a baseball game, even though some ticket prices have skyrocketed. TickPick, a New York-based secondary marketplace provider, said the average cost of a ticket for all the Fourth of July games is $77.58. The most expensive games on the Fourth of July are the Tampa Bay Rays at the Chicago Cubs for $160.24, the San Diego Padres at the Cleveland Indians for $127.12 and the Cincinnati Reds at the Colorado Rockies for $95.26, the company said. Cheaper tickets for one of America's favorite pastime are also available. The least expensive games for next Tuesday are the Miami Marlins at St. Louis Cardinals for $36.58, the Baltimore Orioles at Milwaukee Brewers for $45.74 and the Chicago White Sox at Oakland Athletics for $51.54. If there's any consolation to all the spending for the sake of patriotism, gas prices are at their lowest levels for Independence Day since 2005.